Solin (Croatia) – February 1, 2019 (travelindex.com) – The historic and charming city of Solin on Croatia’s Adriatic Coast, build on the location of ancient city of Salona will host of the 26th INTERSTAS, the 22nd ITF’CRO-International Tourism Film Festival and the 17th CEA-CRO 2019, all three international events, already traditional, internationally affirmed multimedia project with a world-renowned reputation, are unique manifestations of this kind in Croatia. Conceived to actively contribute to the stimulation of international integration processes of modern tourism, over the past years has gained the reputation of a very dynamic and important meeting. It is held in a very convenient time, the beginning of active preparation for the next tourist business year. All three events are members and partners of world associations; travel, tourist film, tourist journalism, landscape, ecology and sustainable development; FIJET, FEST, ITCO, CiB. With the support of these world associations and the host of Hotel President Solin, all three events are held under the patronage of the Split-Dalmatia County, Town of Solin, and with the high patronage of the Croatian Parliament and the President of the Republic of Croatia, Mrs. Kolinda Grabar-Kitarović. The event begins on Wednesday, November 13th at 6pm with a commemorative program, at 7pm the ceremony of raising the flag, then a retrospective of the films awarded at the recent Tourfilm Festival – ITF’CRO. On Thursday, November 14th from 10am; continuation of the work of all three events, protocol and work presentation of the Exhibitors / Laureates – winners of International tourist awards and prizes; KEA-CRO, THE FEST AND THE GOLD INTERSTAS ‘2019. The closing ceremony of the entire event is on Friday, November 15th from 7pm, with the award; Certificates for Croatian competitors for INTERNATIONAL GOLDEN FLOWER – CiB, special awards “Dr.Luka Čikeš”, International tourist awards: FEST ‘2019. 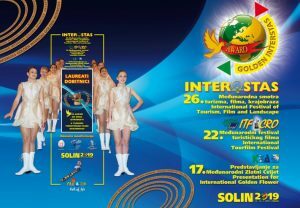 and GOLD INTERSTAS ‘2019 and the film festival awards, certificate and Grand Prix for 22nd ITF’CRO 2019. Per Programmes. All three international events, already traditional, internationally affirmed multimedia project with a world-renowned reputation, are unique manifestations of this kind in Croatia. Conceived to actively contribute to the stimulation of international integration processes of modern tourism, over the past years has gained the reputation of a very dynamic and important meeting. It is held in a very convenient time, the beginning of active preparation for the next tourist business year. In the realization of these events, connecting the world’s tourist, film-festivals, cultural and landscape associations, combining culture, tourism, tourism, ecology, strengthen the positions of these three events. This is also actively contributing to the development of environmental awareness, sustainable development, ecology and quality of life. Every year, an increasing number of accredited participants are also very excited, among them, with prominent individuals and organizations – Laureates, authors and producers of tourist films are domestic and foreign tourist journalists. Through 3 business days (Wednesday, Thursday and Friday), along with exhibitions, the presentation of the Laureates – winners of international tourist awards, projection of tourist films, presentation of this exhibition are organized; an international symposium, a “round table”, film, tourist, educational ecological workshops, special promotions, professional excursions and exploring historical, cultural and other sights in the surroundings. It is an opportunity for meetings and the realization of numerous contacts, business conversations, exchange of international experiences and knowledge with people who make important decisions from the domain of international tourism, environmental protection, sustainable development, production and production of tourist film … With journalists covering these events, and of world media promoters – Travelindex, immeasurable contribution to events promoting tourism Solin / Split, Split-Dalmatia County, and tourism branding of Croatia in the world. This project significantly contributes to the overall development of cultural tourism in the world. We are also proud of the fact that we have recognized the world and European landscape, film festival and tourist journalists’ associations; FEST, FIJET, ITCO, CiB. The assessment is that this event, by encouraging the international integration of contemporary tourism through the connectivity of the participating entities, contributes jointly to the development of tourism, tourism film, environmental preservation, better quality of life, and overall international tourism exchange, thereby meeting the high demand tourism in all its segments. It significantly contributes to the recognizability of the tourist product of all the local, regional, national participants participating in it, and thus a better understanding between nations and countries, which is also the fundamental objective of this event. With a welcome to all the participants of the event in Solin / Croatia in 2019, in advance, our sincere congratulations to Laureates, and with that, the entry into the International Club for the Development of Tourism.